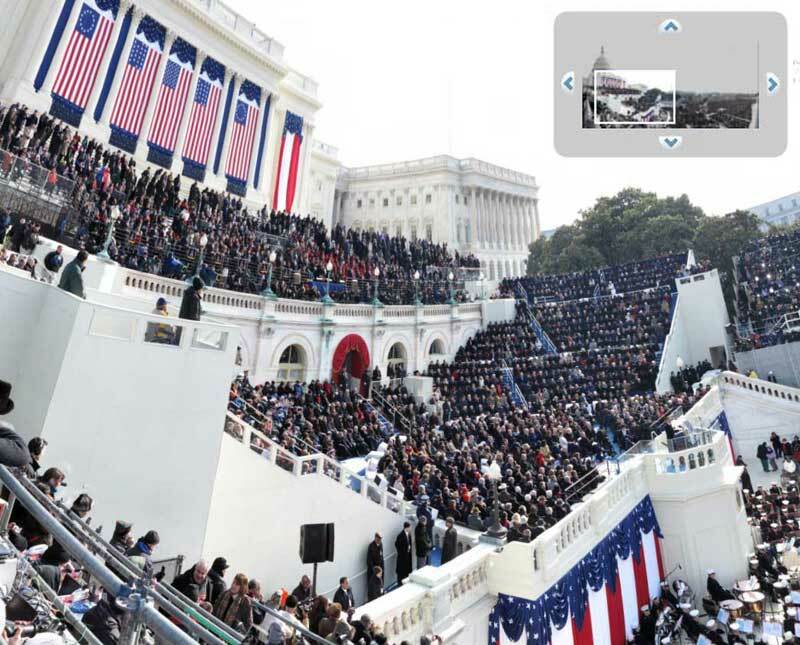 this Gigapan image by David Bergman is from the north press platform during President Obama's inaugural address at the U.S. Capitol in Washington, DC on January 20, 2009. It's made up of 220 images and the final image size is 59,783 X 24,658 pixels or 1,474 megapixels. A newly released memo co-written by former Deputy Attorney General John Yoo shows the extent to which the Bush administration was willing to go to execute the "war on terror." (Photo: Don Bartletti / The Los Angeles Times) A new memo shows just how far the Bush administration considered going in fighting the war on terror. But the memo from the Justice Department's Office of Legal Counsel-along with others made public for the first time Monday-illustrates with new details the extraordinary post-9/11 powers asserted by Bush administration lawyers. Those assertions ultimately led to such controversial policies as allowing the waterboarding of terror suspects and permitting warrantless wiretapping of U.S. citizens-steps that remain the subject of ongoing investigations by Congress and the Justice Department. The memo was co-written by John Yoo, at the time a deputy attorney general in the Office of Legal Counsel. Yoo, now a professor at the Boalt Hall School of Law at the University of California, Berkeley, has emerged as one of the central figures in those ongoing investigations. In perhaps the most surprising assertion, the Oct. 23, 2001, memo suggested the president could even suspend press freedoms if he concluded it was necessary to wage the war on terror. "First Amendment speech and press rights may also be subordinated to the overriding need to wage war successfully," Yoo wrote in the memo entitled "Authority for Use of Military Force to Combat Terrorist Activity Within the United States." This claim was viewed as so extreme that it was essentially (and secretly) revoked-but not until October of last year, seven years after the memo was written and with barely three and a half months left in the Bush administration. At that time, Steven Bradbury, who headed the Office of Legal Counsel throughout Bush's second term, concluded that Yoo's statements about overriding First Amendment freedoms were "unnecessary" and "overbroad and general and not sufficiently grounded in the particular circumstance of a concrete scenario," according to a memo from Bradbury also made public Monday. On Jan. 15, 2009-with only five days left before Bush left office-Bradbury also rescinded three other legal memos written during the president's first term that claimed broad powers to unilaterally suspend treaties, bypass restrictions on domestic surveillance and take other actions to combat terrorism without the approval of Congress. Bradbury said in a separate legal memo that the claims made in these earlier memos were based on unsound legal reasoning and should not be viewed as "authoritative." 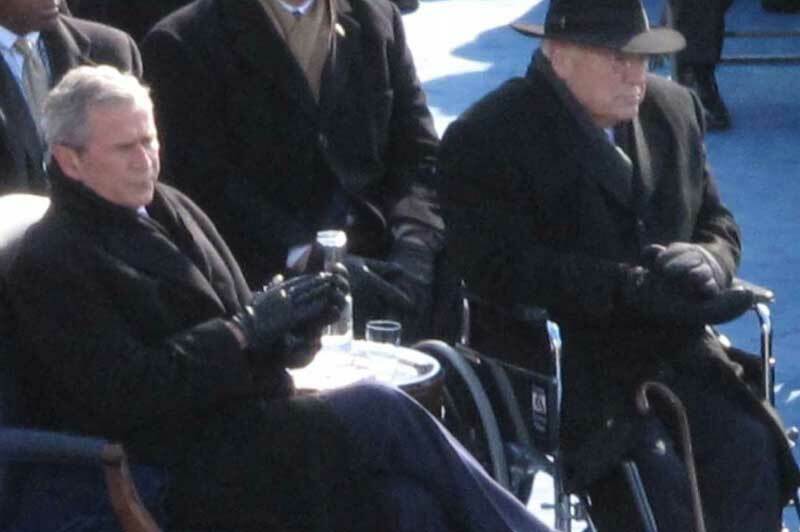 But he offered no explanation for why he waited until the waning days of Bush's presidency to withdraw them. The most controversial, and best known, of Yoo's legal opinions was his Aug. 1, 2002, memo that effectively approved the president's right to disregard a federal law banning torture in ordering the interrogation of terror suspects. An accompanying (and still unreleased) memo from the same day approved the CIA's authority to use "waterboarding" (or simulated drowning) against terror suspects. In a related matter, the CIA acknowledged in a legal filing Monday that it has destroyed 92 interrogation tapes of two suspects who were subjected to waterboarding. While it was previously known that the agency had destroyed some tapes, the number of destroyed tapes was far more "systemic" than had previously been known, according to Amrit Singh, a lawyer with the American Civil Liberties Union, which has been seeking records about the destroyed evidence under a Freedom of Information Act lawsuit. A U.S. government official familiar with the matter said all of the destructions took place in November 2005 and mostly involved the interrogations and detention of Abu Zubaydah, a "high-value" detainee who was captured in March 2002 and remains today at the U.S. detention facility at Guantánamo Bay. A small number of the destroyed tapes also involved the interrogation and detention of another suspect, Abd al-Rahim al-Nashiri, an alleged architect of the October 2000 bombing of the USS Cole. Justice Department special counsel John Durham, who is investigating the destruction of the tapes, previously said he planned to finish his interviews by the end of February, but has given no indication of whether he plans to charge anybody involved with a crime. The newly disclosed Oct. 23, 2001, memo was in response to a request from Gonzales, at the time President Bush's top lawyer, and Haynes, who was chief counsel at the Pentagon, to determine if there were any restrictions on the use of the U.S. military inside the country in targeting terror suspects. The Yoo memo essentially concluded there were none. The country, he argued, was in a "state of armed conflict." The scale of violence, he argued, was unprecedented and "legal and constitutional rules" governing law enforcement-such as the Fourth Amendment prohibition on "unreasonable" searches and seizures-did not apply. At one point, the memo says, the U.S. military could be used for "targeting and destroying" a hijacked airline or "attacking civilian targets, such as apartment buildings, offices or ships where suspected terrorists were thought to be." At another point, the memo advices: "Military action might encompass making arrests, seizing documents or other property, searching persons or places or keeping them under surveillance, intercepting electronic or wireless communications, setting up roadblocks, interviewing witnesses or searching for suspects." IN ACCORDANCE WITH TITLE 17 U.S.C. SECTION 107, THIS MATERIAL IS DISTRIBUTED WITHOUT PROFIT TO THOSE WHO HAVE EXPRESSED A PRIOR INTEREST IN RECEIVING THE INCLUDED INFORMATION FOR RESEARCH AND EDUCATIONAL PURPOSES. TRUTHOUT HAS NO AFFILIATION WHATSOEVER WITH THE ORIGINATOR OF THIS ARTICLE NOR IS TRUTHOUT ENDORSED OR SPONSORED BY THE ORIGINATOR.